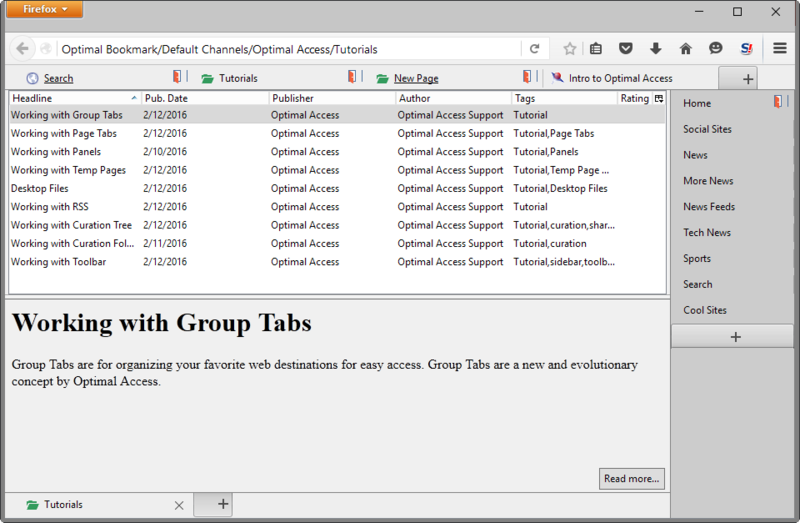 Optimal Access is a new add-on for the Firefox web browser that reenvisions how Tab Groups work in the browser. 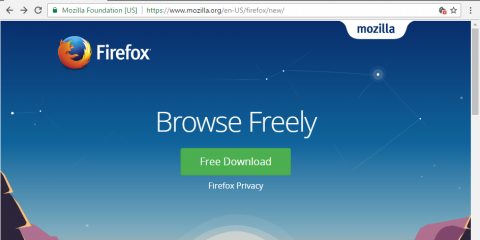 Mozilla announced some time ago that it would remove the built-in tab grouping functionality of Firefox, citing lack of use and development focus on more important parts of the browser as reasons for the decision. 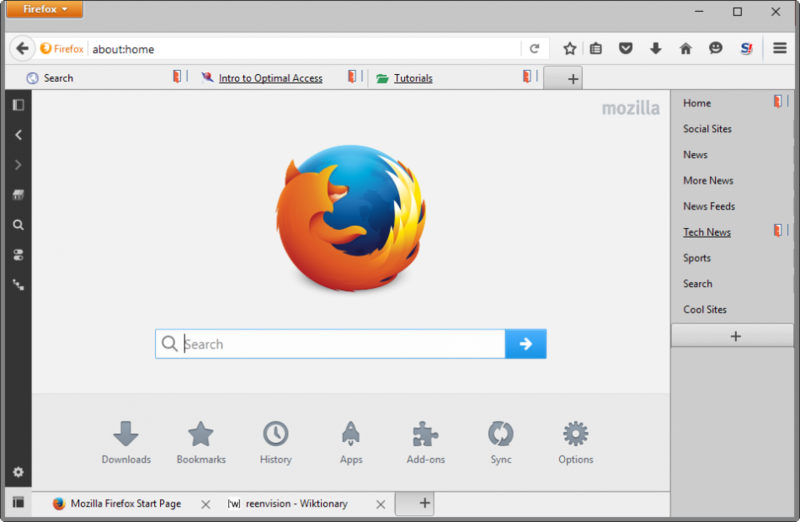 Developers did not let Mozilla down as they created add-ons like Tab Groups or Simplified Tab Groups which re-introduced the feature to the browser (Mozilla plans to remove Tab Groups in Firefox 45). Optimal Access takes the concept to the next level and you may wonder what the hell is going on when you see the interface modifications that it brings along with it after installation. Suddenly, there are two tab bars, one at the top, another at the bottom, a sidebar on the right, and a panel on the left. Once you play around with the new interface though, you will notice that everything is placed there for a reason, and that you can customize the layout based on your needs. The right sidebar lists the groups that you have created. The extension ships with default groups that you can delete outright, or change according to your needs. You may want to play around with those default groups for a bit to get a feel for the add-on, but ultimately, you will probably remove them. A click on a group lists all sites associated with it in the top tab bar. These sites are not necessarily opened right away, only the first of the batch is, and it is displayed in the bottom tab bar. The main difference between the top and bottom tab bar is that the top toolbar lists all sites belonging to the selected tab group, while the bottom toolbar the sites that are currently loaded in the browser. 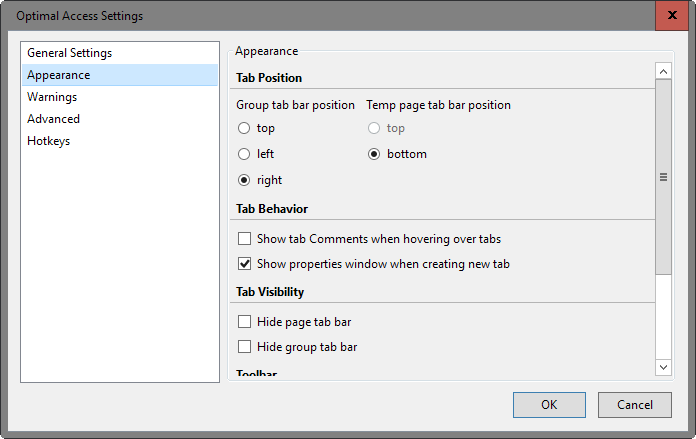 You loads tabs of that group with a click on the tab, and can remove tabs from the bottom tab bar at any time. To add a tab to a group, drag and drop its icon to one of the existing tab groups. 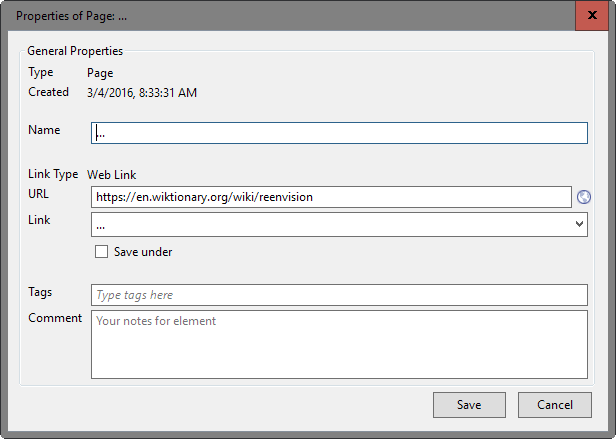 Doing so displays an “add dialog” which allows you to change the name, link, and add tags or comments. Once a site has been added to a tab group, it is displayed alongside all other sites of that group when it is activated. The panel on the left leads to the program settings, search, an option to display Firefox’s sidebar, and other options. You can hide the panel temporarily, or permanently in the options. 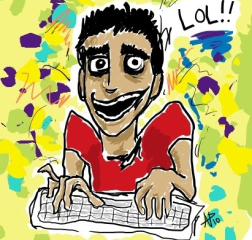 If you do so, you can still access the settings and other features by tapping on the Alt-key on the keyboard, and using the Optimal Access menu added to the Firefox menu to do so. The options provide you with an impressive set of customization features. You may hide or show tab bars and side panels using it, change their position (e.g. display the active pages on top instead of the bottom), or configure auto saving and browser startup behavior. Still, that is not all Optimal Access has to offer. Apart from tab groups, it enables you to create Curation Folders, Web Folders and RSS Links. A curation folder contains a list of articles or resources that is displayed in a table. You can add and remove articles, and access their contents directly by clicking on them in the table. Web Folders are collections of web resources. They don’t use a two-panel interface like curated folders, and work similar to bookmarks therefore. 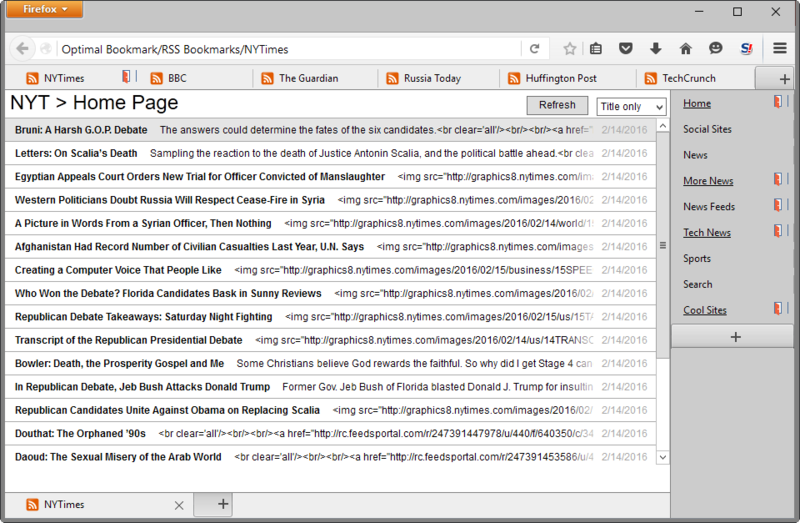 Create RSS news feed groups and access the information they provide directly in Firefox without using an RSS feed reader to do so. 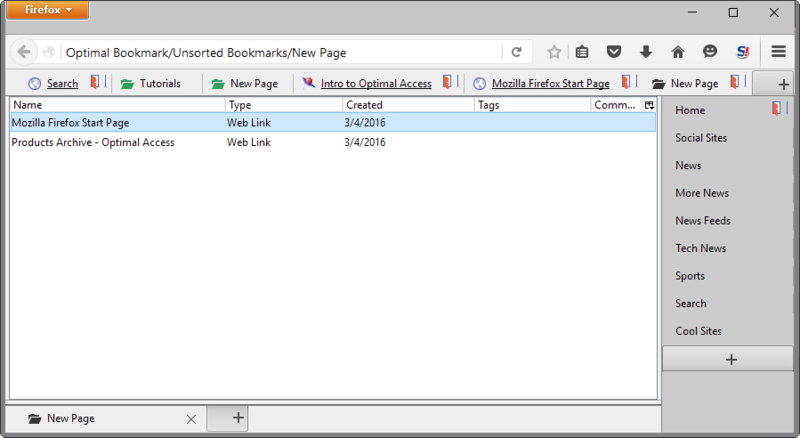 Optimal Access is a powerful add-on that adds many Tab Groups related options to the Firefox browser. It is a bit slow at times, for instance when switching between groups or loading individual sites, but that is probably nothing that a bit of optimization cannot improve. For some, it may be overkill as it throws lots of options at you. If you just need tab grouping functionality, you will probably like simpler add-ons better than this one, but if you want more control and options, then you should take Optimal Access for a test ride to see if it fits the bill. The post Optimal Access reenvisions Tab Groups in Firefox appeared first on gHacks Technology News.